Healthy brain aging and the problems of dementia and Alzheimer’s disease (AD) are a global concern. Beyond 60 years of age, most, if not everyone, will experience a decline in cognitive skills, memory capacity and changes in brain structure. Longevity eventually leads to an accumulation of amyloid plaques and/or tau tangles, including some vascular dementia damage. Therefore, lifestyle choices are paramount to leading either a brain-derived or a brain-deprived life. 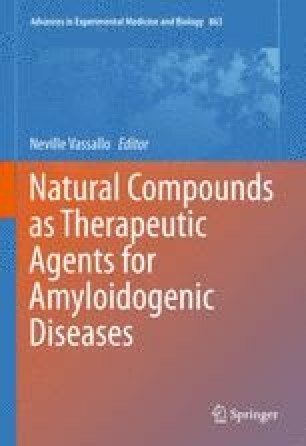 The focus of this review is to critically examine the evidence, impact, influence and mechanisms of natural products as chemopreventive agents which induce therapeutic outcomes that modulate the aggregation process of beta-amyloid (Aβ), providing measureable cognitive benefits in the aging process. Plants can be considered as chemical factories that manufacture huge numbers of diverse bioactive substances, many of which have the potential to provide substantial neuroprotective benefits. Medicinal herbs and health food supplements have been widely used in Asia since over 2,000 years. The phytochemicals utilized in traditional Chinese medicine have demonstrated safety profiles for human consumption. Many herbs with anti-amyloidogenic activity, including those containing polyphenolic constituents such as green tea, turmeric, Salvia miltiorrhiza, and Panax ginseng, are presented. Also covered in this review are extracts from kitchen spices including cinnamon, ginger, rosemary, sage, salvia herbs, Chinese celery and many others some of which are commonly used in herbal combinations and represent highly promising therapeutic natural compounds against AD. A number of clinical trials conducted on herbs to counter dementia and AD are discussed.